(Photo via NPR) Armando Riesco’s character Elliot was inspired by Hudes’ cousin, also named Elliot. Riesco has played Elliot throughout the trilogy. 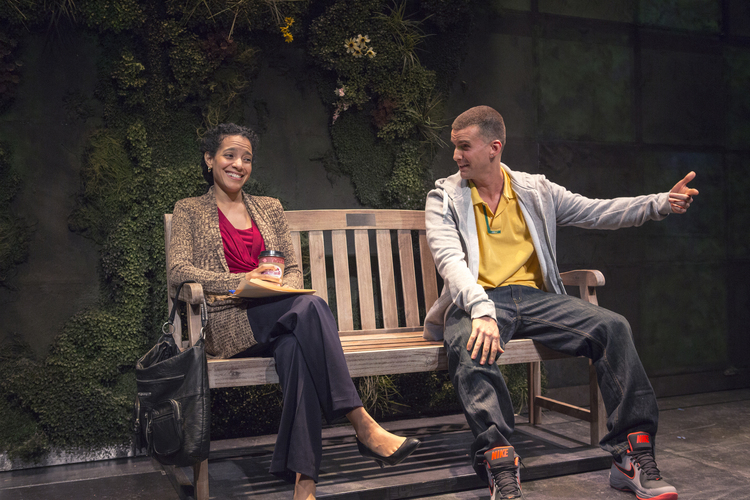 He’s pictured above in Water by the Spoonful with Zabryna Guevara, who plays Yazmin Ortiz. I’m really excited to be attending the opening night of Water by the Spoonful, a Pulitzer Prize-winning play by Quiara Alegria Hudes, tonight. Hudes is a Philadelphia native of Jewish and Puerto Rican descent. Water by the Spoonful is the second play in a trilogy featuring a character named Elliot, an injured Iraq war veteran who has returned to his home in North Philadelphia. Elliot is based on Hudes’ cousin, also named Elliot. She says she went to visit him on a military base shortly after he returned from Iraq. Read the rest of Morning Edition’s report, or listen to the audio segment, here. Buy tickets to Water by the Spoonful here.